Thai curries, filled with an assortment of vegetables and rich coconut milk and seasoned with flavorful pastes made of Thai herbs, chilies, spices and aromatics, make satisfying and delicious vegetarian meals. The recipe below gets its red color from a curry paste made with red chilies and other spices. Red curries are usually a bit more spicy than yellow curries and less spicy than green curries, though you can make yours as spicy or as mild as you like by altering the amount of curry paste you use. 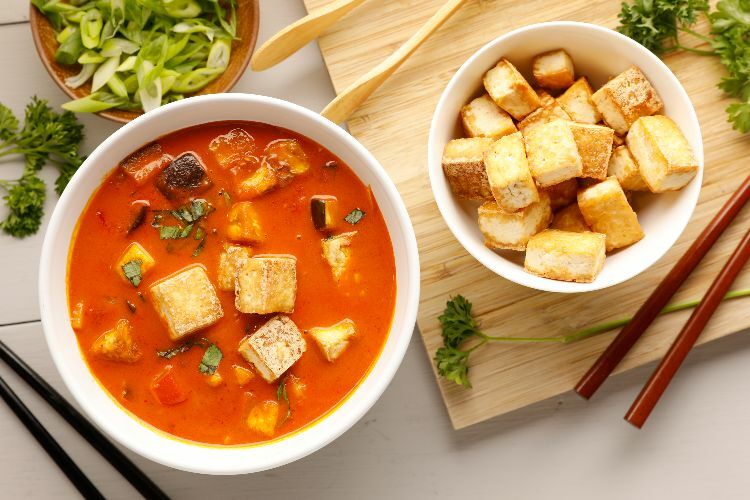 Freezing and thawing tofu before cooking removes much of its liquid and gives it a porous texture that absorbs all of the intense flavors in this curry. If you don’t have time to freeze and thaw it, slice it into slabs and drain it between layers of paper towels topped with a weighted baking sheet to remove excess moisture. If you’re using a store-bought red curry paste, check the ingredients to make sure it is vegetarian (some contain shrimp paste or fish sauce). Heat 2 tablespoons of the oil in a large skillet over medium-high heat. Add the tofu in a single layer and cook, turning, until it is browned on all sides, about 10 minutes. In a stockpot, heat the remaining 2 tablespoons of oil over medium-high heat. Add the onions and cook, stirring, for about 5 minutes, until softened. Add the garlic and ginger and cook, stirring, for 30 seconds more. Add the curry paste and stir for another 30 seconds. Add the bell pepper, eggplant, coconut milk, bamboo shoots, turmeric and brown sugar, and stir to mix. 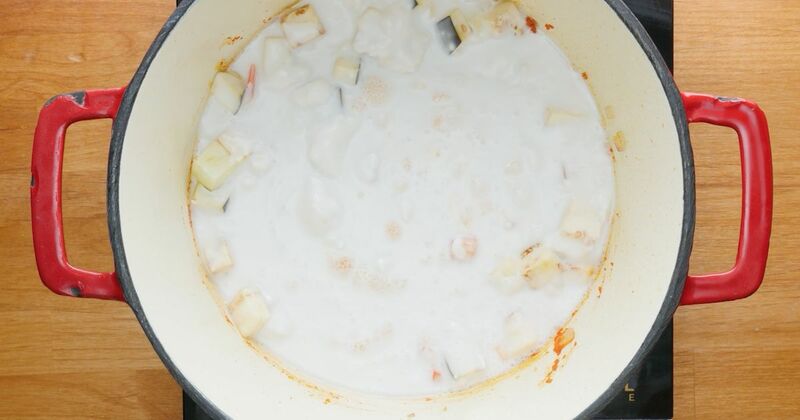 Bring to a simmer over medium heat, then reduce the heat to low and simmer, uncovered, for about 15 minutes. Serve hot, garnished with chopped fresh basil.